The International Interior Design Association (IIDA) has designated Indiana State University as a campus center. Indiana State's interior design program is just one of two such campus center programs in the state, said Mary Sterling, associate professor in the department of built environment in the ISU College of Technology. Stephanie Kreps, a sophomore interior design major from Richmond who is the student representative for IIDA at Indiana State, e-mailed a professional member at the organization's headquarters in Chicago. The person replied that she was looking forward to seeing ISU's application to become a campus center. After discussing the e-mail with Sterling, Kreps began the application process. "It does give students more opportunities to get involved, but the thing about the campus center is it's not just for interior design students," Kreps said. "Anyone at ISU, anyone in the whole community can get involved in events that are held by the campus center." The designation allows for interior design professionals who are also IIDA members to learn about the students and program at Indiana State, Sterling said. "The biggest advantage for them would be an opportunity to educate future designers, and have a preview of who will be graduating and therefore who might be available for an internship experience, or who might be seeking full-time employment," the professor added. The IIDA represents interior design professionals in commercial design, which includes health care, historic preservation and restoration, commercial office and hospitality, Sterling said. The organization is beneficial because it also provides working professionals with continuing education opportunities, she added. Interior design students anticipate hosting speakers and taking advantage of IIDA programs as a result of the new campus center designation, said Megan Edwards, junior interior design major from Bedford. She is the president of the Indiana State chapter of Interior Designers Embrace Amplification, the umbrella organization of students in the program that also includes IIDA. "I think it's going to be really great for the interior design program because even on campus, a lot of people don't know what a good program we have," Edwards said. 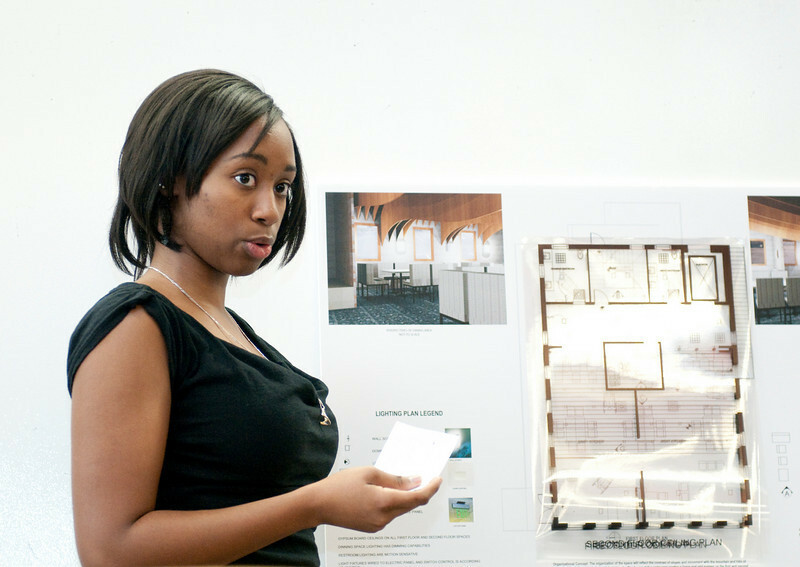 Interior design students have the opportunity to be a part of several professional organizations, though IIDA might get a more attention when first-year students majoring in interior design review potential programs to join early next year. "It's a really competitive field," Kreps said, "so any opportunity to meet professionals is always a good thing." Photo: http://isuphoto.smugmug.com/Events/Interior-Design-Presentation/i-2s2hv8J/0/L/023_BSB6483-L.jpg (ISU/Bethany Baker)An Indiana State University interior design student giving a presentation. ISU has been designated as a campus center by the International Interior Design Association.